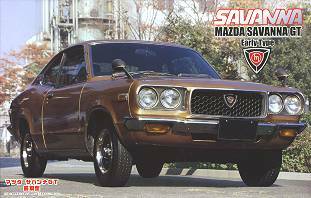 The Mazda Savanna coupe, known outside of Japan as the Rx-3, is one of those cars that I usually exclude from my collection because it is just a rotary powered variant of a piston-engined car (in this case a Mazda 808). However, these Fujimi kits are so nice that it was just too hard to ignore 'm . The Savanna Rx-3 was sold from 1971 to 1978. In 1972 a Savanna GT and a high-performance GS-II version were added, both were fitted with 5-speed manual gearbox and powered by the 12A engine that was also in the Capella Rx-2. 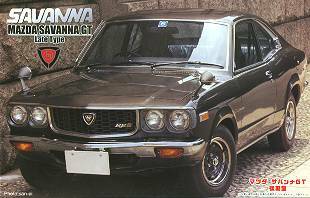 In 1975 the body styling was updated and the 10A engine powering the Japanese Savanna coupe versions was replaced with the 12A engine that had already been fitted to domestic GT, GS-II and export Rx-3 versions. 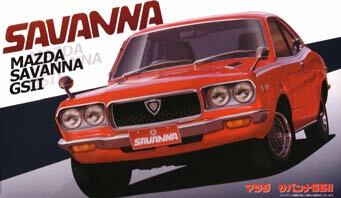 The Savanna Rx-3 was the direct predecessor of the Rx-7 SA and was very successful in motor racing. Some styling cues of the later RX-7 models refer to the Rx-3, such as the circular tail lights of the 1991 FC and 1999-2002 FD. The Fujimi kits are curbsides (no engine bay details), but chassis and cabin interior are accurate and well detailed. 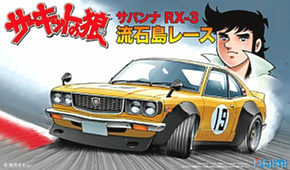 Sofar Fujimi only released Japanese domestic Savanna versions, but I can not imagine they would let the chance slip to do an export Rx-3 coupe version at some later date. 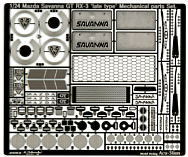 Acu-Stion have released a pair of photo-etched metal detail sets designed for the Fujimi Savanna kits. This kit represents a Japanese domestic 1972-1974 Savanna GT coupe, fitted with a 12A engine. The body comes with a separate nose piece, tail light clusters and plated insert C-pillar badges. The interior comes with a well detailed righthand drive dashboard with a set of pedals attached, an interior tub with separate side panels and nicely molded seats, separate steering column, shift lever, hand brake and rear view mirror. Sun visors are molded against the top edge of the windshield. The clear parts tree offers separate lenses for all of the front and tail lights and a single piece glass tub with no open windows. The chassis offers accurate detail, a separate sump guard, front struts with separate disc brakes and a separate live rear axle with leaf springs and brake drums. The wheels represent pressed steel wheels and come fitted with Pirelli Cinturato P7 tires sized 215/50 15in. The wheels and tires are slightly oversized (the actual car was fitted with 13in wheels and 155 SR tires). A brightly 'chrome' plated tree offers parts for the front and rear bumpers, wing mirrors, C-pillar badges and side marker/indicator lights. 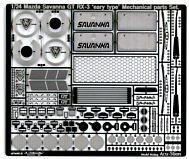 The decal set is one common set for the early and late type kits of the Savanna GT. The set includes license plates, instrument and radio faces, a wide range of emblems for nose, side and rear of the body and for the steering wheel. The decal set offers both an RE10 badge (35) and an RE12 badge (31) for the rear, making it easier to turn the kit into a base model Savanna. The box shows a pair of pictures of an actual early type Savanna GT coupe, the picture of the rear of the car shows the RE12 badge. Body, nose piece and tail light clusters are molded in white, interior parts and chassis parts are molded in black. 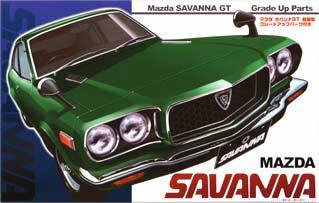 This is a variant of the Savanna GT Early Type kit in a slightly larger box. Body and nose piece are molded in white, interior parts and chassis parts are molded in black. This is a variant of the GS-II kit with additional racing decals and new wheels. an additional set of decals with racing badges, stripes and numbers and a patch for the hood with a carbon weave pattern (I'd prefer painting the hood satin black myself as that would be more correct for the period). The GS-II decal set is not included, the GT decal set still is. Tires are again Pirelli Cinturato P7 tires sized 215/50 15in. This kit represents a Japanese domestic 1975-1978 Savanna GT coupe, fitted with a 12A engine. This model comes close to an export Rx-3 coupe version, apart from the lack of a lefthand drive dashboard and door mounted side mirrors. Body, nose piece, interior parts and chassis parts are all molded in black. This is a limited edition of the Savanna GT Early Type kit with a set of photo-etched metal upgrade parts added. The metal parts includes a full set of exterior badges, windshield wipers, wing mirror faces and some pieces of interior trim. 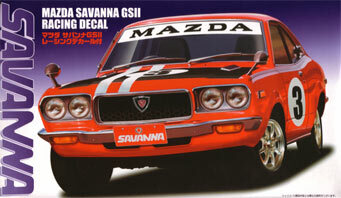 Decals are identical to those in the regular Savanna GT kits. Body, nose piece and tail light clusters are molded in dark green with a nice subtle metallic effect, interior parts and chassis parts are molded in black. This is a limited edition of the Savanna GT Late Type kit with a set of photo-etched metal upgrade parts added. The metal parts includes a full set of exterior badges, windshield wipers, wing mirror faces, a set of drilled pedals and some pieces of interior trim. Body and nose piece are molded in dark brown, interior parts and chassis parts are molded in black. This is a limited edition of the GS-II kit with its body and nose piece molded in a purple shade with fine multi-color metallic flakes. There is a choice of two sets of wheels: one set of 8-spoke Minilite/Watanabe wheels, the other a set of brightly plated solid disc wheels that is depicted on the box art. The factory wheels are not included. Note that the suspension parts are not modified, so the kit will not sit as low as the box art suggests. 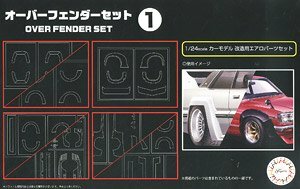 The decal set included is the regular set for the Savanna GT kits, the additional sets from the GS-II kits are not included. Body parts are molded in metallic purple, Watanabe wheels, chassis and interior parts are molded in black, bumpers, trim, wing mirrors and solid wheels are brightly plated. 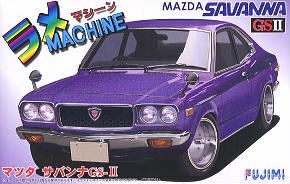 For 2008 Fujimi revised its catalog, this kit received the same catalog number as the now deleted Savanna GT Late Type. This new kit represents a street racer, it has all of the exterior features of the actual race cars, but has a stock interior and exhaust. The fenders of the body have to be cut wider to enable the fender flares and wide wheels to fit. Two sets of decals are included, one is the regular set for the Savanna GT kits, the other one is the same as the GS-II Nostalgic Racer kit. Body parts, spoilers and fender flares are molded in white, chassis and interior parts are molded in black, wheels and bumpers are satin plated. This is a limited edition of the same kit as the previous Savanna GT Racing release, with new decals. 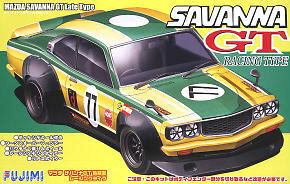 Two sets of decals are included, one is the regular set for the Savanna GT kits, the other one is a large new set with white trimmed green stripes and some sponsor decals, making the car look like one of the famous Savanna race cars that competed in the Japanese Touring Car championship in the early seventies. Body parts are molded in yellow, spoilers and fender flares, chassis and interior parts are molded in black, bumpers and trim are brightly plated, wheels are satin plated. 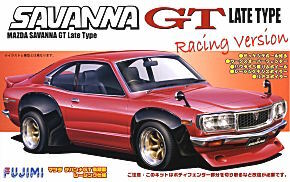 This release depicts a late type Savanna GT as it appears in the japanese manga 'The Circuit Wolf'. 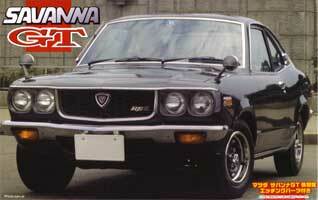 Despite the RX-3 designation the model is righthand drive only. The kits parts are identical to the previous Savanna GT Racing release. A new set of decals is included with 'The Circuit Wolf' license plate decals and racing numbers in addition to the decals for the regular Savanna GT kits. Body parts, spoilers and fender flares are molded in white, chassis and interior parts are molded in black, bumpers and trim are brightly plated, wheels are satin plated. This set contains detail items for an early type Savanna, plus a lot of spares for a late type. Included are license plates, radiator grille mesh, radiator face, windshield wipers, seat belt buckles, mirror faces, brake disc faces, wheel balance weights, reflectors for head and tail lights, various types of fasteners and a wealth of badges. Of particular interest is the 'RE120 AP' badge for a late type Savanna and the new style 'MAZDA' badges that can also be used on an Rx-7. This set is almost identical to the Acu-Stion set for the Savanna GT 'early type', the only difference is in the pattern of the radiator grille mesh. This set contains the F and H trees of the Savanna GT Racing Version kit, plus a set of generic sponsor decals. This boxed set contains 10 sets of fender flares and other upgrade parts, plus a small set of generic sponsor decals. Among the sets are the F and H trees of the Savanna GT Racing Version kit.